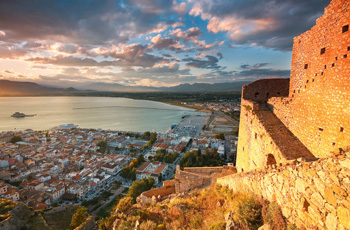 Nafplio is one of Greece's prettiest towns. Hang out in its lively squares, bustling cafés, and waterfront restaurants. Discover its Venetian Castle and quaint narrow pedestrian lanes. Strike out into the beautiful countryside beyond to explore the incredible concentration of nearby ancient and archeological sites. Day trip options: Epidaurus, Mycenae, Corinth, Mystra, Hydra Island, Athens, and many more! Suggested day-trips: the ancient theater at Epidaurus, the island of Hydra, Agamemnon's ancient city of Mycenae, the coastal village of Vivari, ancient Corinth, the Venetian coastal fortress town of Monemvasia. Sightseeing in Nafplio: the romantic, waterbound Bourtzi castle; the 18th century Palamidi fortress; the collection of artifacts at the Archaeological Museum; the prize-winning Peloponnesian Folklore Museum; the nearby sandy beach at Karathonas; and the dozens of unique shops and diverse restaurants. Go back in time by meandering some of the mountainous secondary and tertiary roads of the Peloponnese. You will encounter shepherds tending their flocks using crooks right out of a Sunday school play. You will see breathtaking landscapes reminiscent of the Alps.